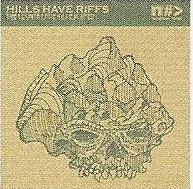 Hills Have Riffs - "The Countryside Has Escaped"
From somewhere in the UK, Hills Have Riffs is DCW Briggs, front man of heavy post-rockers Cove, and this is his collection of six doom-folk compositions. THE COUNTRYSIDE HAS ESCAPED PART 1: beautiful lilting folk guitar along with a cello, no vocals. WILLOW WOMAN: vocals and second fuzz guitar on this one, no drums or bass but some nice keyboard drones, pretty and pleasant, somewhat uneventful. Definitely has the Syd Barrett vocal sound and vibe! I LAY EIDERDOWN: yes, sounds like Swans without the female vocals of Jarboe. I guess this would be considered an EP?! For the last many several years I've thought of drums and bass as something that just covers up the music and this CD doesn't have any drums and very little bass?! GYBSON EMBRYO: very simple riff but nice and tasteful, the entire CD is very pleasant, nothing artistically distasteful or intellectually offensive or just plain crappy! YOU ARE STRANGE TO ME: the vocals remind me of Michael Gira of the Swans, even sounds a bit like the Children of God album. An interesting combination of post punk doomy vocals with straight up folk strum, sounds modern and timeless! I've always liked the combination of electric lead guitar with acoustic strum! Very driving without being just rock music, hey it's art, it's psychedelic! THE COUNTRYSIDE HAS ESCAPED PART 2: yes DCW has definitely ingested some Syd Barrett along the way and I hear a bit of Julian Cope, also has a charming lo-fi quality..."waiting for you..."